The idea of switching on your electronic gadgets while on the plane was almost impossible a decade ago. The fear of interference with radio signals in airlines has made airline companies prevent any type of electronic device from being used while on flight. But times have changed and not only electronic devices are allowed, wireless broadband internet through wifi is now possible. Although adoption is per airline company, the idea of offering wireless broadband internet is becoming a possibility. In the US, American Airlines started the trend by offering wireless broadband last August. This service is offered in non-stop coast-to-coast flights in their larger planes. Not to be out done in services and features, Delta as also announced that they will be offering wireless broadband internet in 2009. 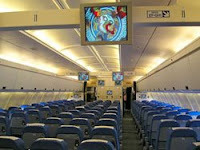 The services will be offered to all passengers from first class to economy. Airlines will offer this service for a fee. The technology that’s being used by Delta and American Airlines is provided by an Illinois-based company named Aircell LLC. Their services is called “Gogo Inflight Internet.” The company uses transmitter sites distributed in different parts of the country so that users will continue to experience consistent internet connection while on flight. Air Canada is already using the technology and was in fact, the first customer of Aircell LLC. The idea of mobility is not only limited in Wifi. Malaysia Airlines is launching mobile phone use while in flight. This revolutionary technology may take time before worldwide adoption but the fact that it could be done should get everyone hopes up.